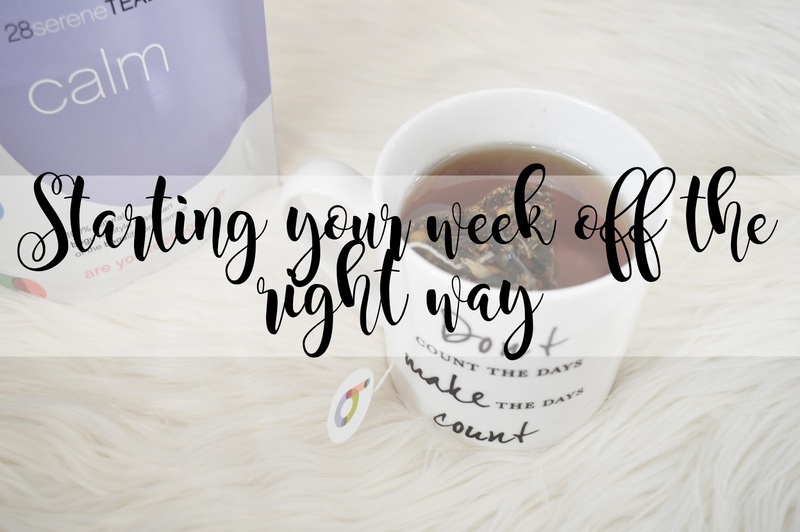 Today I am going to be sharing ways in which you can start off your week the right way to then have a full week of happiness and productivity. Obviously, this won't always be the case. You can start off your week the right way and something happens which makes the rest of the week pretty rubbish; that's life for you. However, recently I've found it rather difficult at the beginning of the week and I've found the first two or three days rather rubbish of every week which has then ruined the rest of the week for me, which isn't ideal especially when I work in a school on a Thursday and a Friday and going into work in a foul mood would not be a great start to each day! I feel like starting your week off the right way is a great way of building on your motivation to get everything ticked off your "to do list" or to achieve something, because if you're in a good mood, you're more likely going to get things done. Right? Over the past few weeks when I have had a pretty rubbish start to the week, my motivation has gone drastically down hill and I haven't wanted to continue on with my week and tick off everything that needs doing and this does effect me mentally. So if you'd like to know ways in which you can start off your week the right way then carry on reading! Weekly planners are a great way of kick starting your day by knowing exactly what is happening on the first day of the week, if you need to complete any chores and whether you have any events coming up! I love using a diary as a weekly planner, but there are some brilliant weekly planners out there which you can stick on your wall and always make reference too! It's great knowing whether you need to be somewhere at some point during the week and how you can work your day around this. I've spoken about this on a previous post but I cannot explain how important it is to do the daunting task first. Once you have conqured this task which is insanely boring, you'll feel a lot more motivated to complete the rest of the tasks which are on your list of things to do! This may sound like a rather strange point to start off your week the right way, but trust me it works! If I know all of the washing up, cleaning and washing has been done on the Sunday, you know you do not have to do it first thing on a Monday Morning. You can go downstairs to a beautifuly clean kitchen and kick start your day with no mess around you! We all know exercise releases some sort of chemical into our body/brain which makes us feel better but this chemical really does work. When I'm feeling down or stressed, exercise helps to calm me down and make me feel better. By starting off your week by exercising, not only are you getting a little bit of fitness into your day but you'll feel so much better afterwards! Be grateful of every little thing. You're healthy and you're alive! If something goes wrong, find the positive side of it and be grateful for the little pieces of happiness which make make you feel alive! New week? New goal. Set yourself a new goal which you can achieve by the end of the week! I'm sure I'm not the only one but I gain such satisfaction when I have achieved my goals and I try to set a new goal weekly which I can head to! Success is not only a great way to end the week but it's a great way to start the week too! Have you set any new goals for yourself recently? Whether this is personal or for your blog?